The Samsung Galaxy Note 2 Flip Cover was developed with the user's lifestyle in mind. This case, designed to protect the Galaxy Note 2 Smartphone without adding bulk, is the perfect combination of style and durability. Take it to the gym, on a hike, to the grocery store or an evening out on the town. This case is constructed to withstand even the most active lifestyle while allowing the user to display their sense of fashion. Many smartphone cases make you choose between protection and fashion. With the new Flip Cover for Galaxy Note 2 you get both! 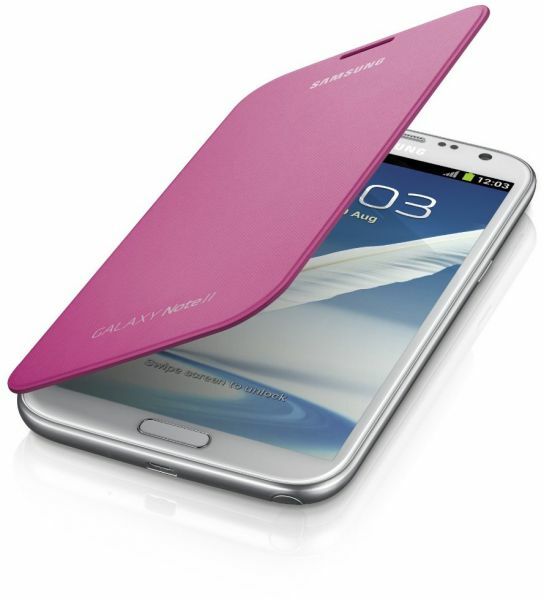 The Samsung Flip Cover provides superior protection for the Samsung Galaxy Note 2 smartphone. The front cover protects the smartphone's screen when it is not in use and it is easily flipped open for full access to the Galaxy Note 2's screen - whenever you need it. The Samsung Galaxy Note 2 Flip Cover is available in Blue, Marble White, Light Blue, Pink, Mint, Lime Green, Orange, Wine, and Pebble Blue so there is certain to be a color to match anyone's personality. Even the most fashion-sensitive smartphone user will find a case, or two or three, that matches their personal style. Additionally, these cases have been specifically designed for the Samsung Galaxy Note 2 smartphone. The back easily snaps on, replacing the phone's standard battery cover, without making the phone bulky. Installing a Samsung phone case is simple and only takes a few seconds. Samsung Electronics Corporation researches, develops and markets a variety of personal and business communications products including mobile phones, tablets and associated accessories. For the past five years Samsung has been recognized as the number one mobile phone manufacturer in the world based on customer loyalty and is the largest manufacturer of mobile phones worldwide.